Aiming to generate $5 billion worth of purchases via their mobile apps this year, eBay has designed “shoppable” windows to drive digital sales. Will their bricks translate to clicks? The goods artfully arranged in certain windows along Park Avenue advertise “The Inspiration Shop,” but you won’t find them in any actualy stores nearby. They’re eBay’s latest attempt to drive use of their mobile apps. 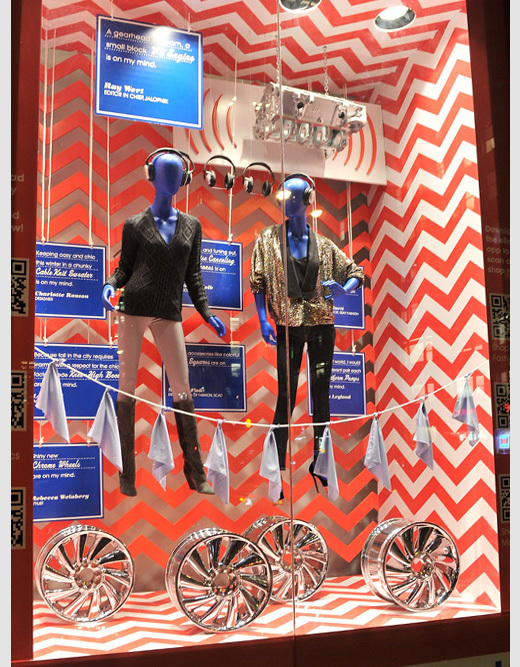 In keeping with its tried and true business model–acting as the marketplace to simply connect buyers and sellers–eBay’s using the Inspiration Shop windows to represent the variety of goods available any time on eBay. 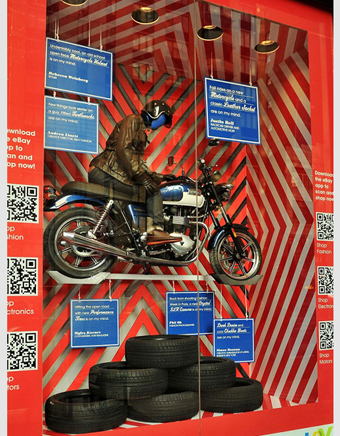 The actual items in the windows range from denim to digital, auto engines to e-readers, and there’s even a motorcycle. The collection was curated by about 30 tastemakers such as race car driver Justin Bell, apparel designer Liz Lange, fashion model Coco Rocha, actress Lake Bell, and others. The concept is part of eBay’s grand mobile commerce strategy that president and CEO John Donahoe says is expected to generate almost $5 billion in merchandise volume this year. That’s more than double the auction giant’s 2010 volume of $2 billion. Overall, the total value of goods sold on eBay was $62 billion last year. Though it’s a small portion of eBay’s current sales, mobile is creating a new commerce environment, Donahoe tells Fast Company, one that blurs the line between online and offline shopping. And it’s growing rapidly as consumers change the way they shop and pay. More than 33.3 million U.S. consumers already browse e-commerce sites on their mobile phones. 8% scan bar codes to get more product information on the go and 7% make a purchase on their devices, according to a report by research firm Experian Simmons. Donahoe asserts that nearly 500,000 new eBay shoppers made their first eBay purchase through the company’s mobile apps between January and July this year. eBay apps have been downloaded 47 million times. “We are focused on enabling commerce, helping consumers shop anytime, anywhere, and being the commerce partner of choice for retailers of all sizes.”Though there are no plans to open similar shops anywhere else in the world, the Inspiration Shop has a presence on Facebook. Brookstone, Bloomingdale’s, Bergdorf Goodman, and Club Monaco, among others, have all taken steps to incorporate QR codes to drive user engagement. Tech-forward fashion megabrands Ralph Lauren and Burberry have also used them in window displays and ads, too. Those “always-open” eBay store windows were also part of its customer service strategy. The company commissioned its own national survey on shopping and found that nearly half of all shoppers enjoy window shopping and want to make an immediate purchase when they spot something they love. However, more than half of shoppers are frustrated with traditional retail environments with their limited inventory, pushy sales people, and long lines at the register. eBay’s QR codes and mobile technology are designed to deliver immediate access to information and ease the aggravation, especially in the categories of fashion, vehicles, and technology. The company’s invested heavily in fashion over the past year, mostly because of the existing success of the channel and its potential, according to Andrea Linett, creative director of eBay Fashion. Linett says a handbag and a pair of shoes are sold on eBay mobile every 45 seconds with prices ranging from bargain finds to coveted designer goods such as an Hermes Black Crocodile Birkin Bag that recently sold for $33,000. She says the installation also reinforces the new shopping experience on eBay. With 62% of all listings at fixed price (buy it now) and 70% new products, the auctions that made the company a juggernaut are now taking a backseat. The same is true for eBay’s second biggest category: autos. Steve Yankovich, VP of Mobile and Platform Business Solutions, asserts that a vehicle is bought through eBay mobile every 15 minutes and 117,000 parts and accessories are sold every week via the app. In the last few months, a Mercedes-Benz SLR McLaren was bought via eBay mobile for $258,971. Shoppers inspired by Jalopnik editor-in-chief Ray Wert’s selected small block V8 engine in the Inspiration Shop can browse their gear-headed hearts out on their phone via eBay’s Motor app. Yankovich explains the app allows users to scan the vehicle identification number (VIN) on their car, add to “My Garage,” and search for parts specific to their vehicle. “It’s a safe and sure way to get exactly what you need without having to see it in a store,” he says. The Inspiration Shop windows will be up until November 10th. Follow Lydia Dishman on Twitter, and Fast Company, too.